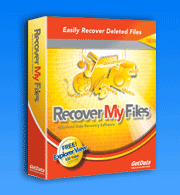 Recover My Files data recovery software is a file recovery utility that quickly and easily recovers deleted or lost digital photographs, images or graphics files. 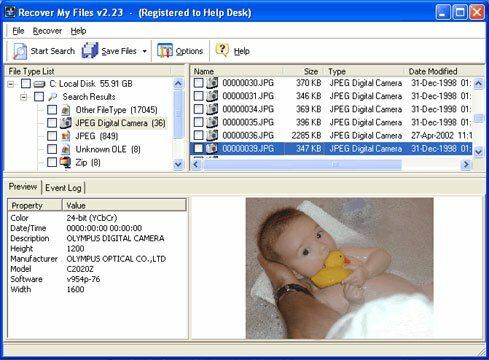 Recover My Files analyses your entire disk or digital camera media at the byte level to resurrect deleted or lost images. Recover JPEG, TIF, TIFF, GIF, BMP, PNG, WMF and more graphics formats. To see the list of other file types that Recover My Files will recover click here. Preview deleted digital photos before you decide to purchase! Recover My Files is more than just a simple unerase program. It will bring back lost digital images and photographs like no other digital media recovery tool. Recover My Files is compatible with digital camera graphics standards. It costs nothing to determine if your digital camera or graphics files can be recovered. Recover My Files is so effective you can even use it to tell what Internet sites users have been visiting on your computer by recovering Internet cache graphics! Recover My Files requires no special technical skills and is simple to use. It is compatible with Windows XP to Win 7 and works with FAT 12, FAT 16, FAT 32 and NTFS file-systems. Recover deleted files from Jaz, Zip disk, Smart media, Compaq flash cards and other removable drive formats. Recover My Files completely automates all aspects of the digital image recovery process. Read our file recovery checklist. To download the demo version and start using now. To order a registration code use the links below. Undelete images the easy way.